Broke millennials: The decline of young adult incomes since the recession. So, exactly how broke are we? And how much worse do we have it than, say, Gen X? Recently, the activists at Young Invincibles took a stab at this question by using Census data to break down how salaries for young adults have evolved in the industries where they’re most likely to work. For Americans between the ages of 25 and 34, annual income earned from wages has fallen in four of the top five biggest employment sectors—retail (down 9.9 percent), the leisure and hospitality business (down 14.65 percent), manufacturing (down 2.87 percent), and professional and business services (down 4.28 percent).1* The one exception is health care, which has been on a tear as America gets older and spending on medicine keeps rising. And even there, yearly pay has essentially stayed flat (up just 0.10 percent). In short, the hiring climate has been so bad in the past few years that young people’s incomes are stagnant even when they work in a hot industry where you often hear about purported labor shortages. For those who work in businesses that aren’t a hiring binge, incomes are down. Here’s another way to look at the pain of the last few years. As the Census Bureau’s historical data tables tell us, the dot-com bust and Great Recession combined to essentially wipe away the pay gains twenty- and early thirtysomethings managed during the late 1990s. At $30,759, the median young adult income is its lowest in inflation adjusted terms since 1995. ** So, right now millennials are earning like Gen Xers, but without the prospect of an Internet-driven economic boom right around the corner to lift up our living standards. (It’s the same basic trend at basically every education level). Then again, young adults aren’t the only demographic whose incomes have been beamed back to the grunge era. Middle-aged and older workers are in the same boat. So what makes this generation different from all other generations? Well, first, there’s the problem of widespread unemployment, though boomers who started working in the early 1980s recessions faced similar challanges. So at the risk of beating a mostly dead horse, the real answer is probably debt. 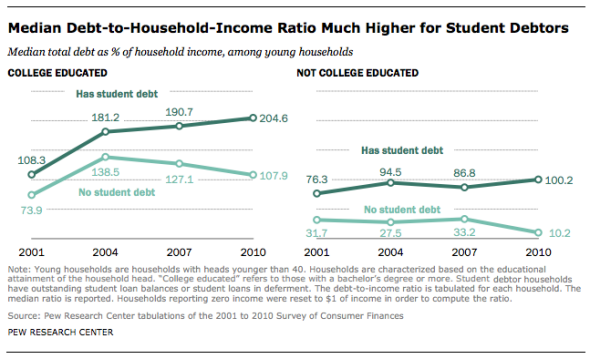 Thanks largely, though not entirely, to student loans, we have a lot of it compared with what we make (the graph below, via Pew, includes households up to age 40, but still gives you the idea). Millennials aren’t much more poorly paid than young adults who came before us. But we are stretching the same wages to pay off a bigger heap of loans. 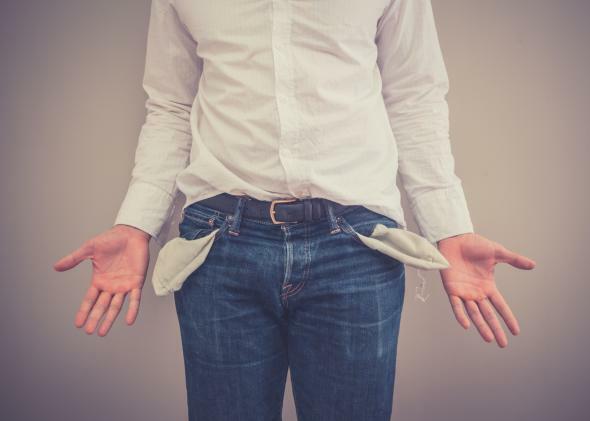 We don’t seem exceptionally broke if you just look at our pay stubs, but, collectively, we are deep in a hole. Footnote1: I’m not convinced professional and business services is a useful category, since it’s an enormous umbrella category that includes everything form lawyers to accountants to office temps. But we’ll live with it. Footnote2: Young Invincibles also analyzed wages from 18-to-24-year-olds, but it seems sort of pointless to look at wages of the prime college-age demographic without distinguishing between full- and part-time workers. *Correction, Dec. 8, 2014: This post originally misstated that education incomes had fallen 2.87 percent for 25-to-34-year-olds. Manufacturing incomes have fallen by that amount. **Correction, Dec. 15, 2014: This paragraph and the two graphs that follow it originally referred to household incomes. They are based on Census data for individual incomes.